Welcome to Neon Poison Skull 3D Theme！Neon Poison Skull 3D is a 3Dlauncher theme with Neon Poison Skull 3D live wallpapers anddesigned icon packs. Download and apply Neon Poison Skull 3D forfree to decorate your Android phone in Neon Poison Skull 3D style,you will get a 3D weather and 3D clock to enjoy a 3D theme visualand interactive experience. Neon Poison Skull 3D is designed forbetter using experience. Neon Poison Skull 3D is designedespecially for Launcher users. Long press to activate each theme’sunique set of 3D theme live interactive effects. 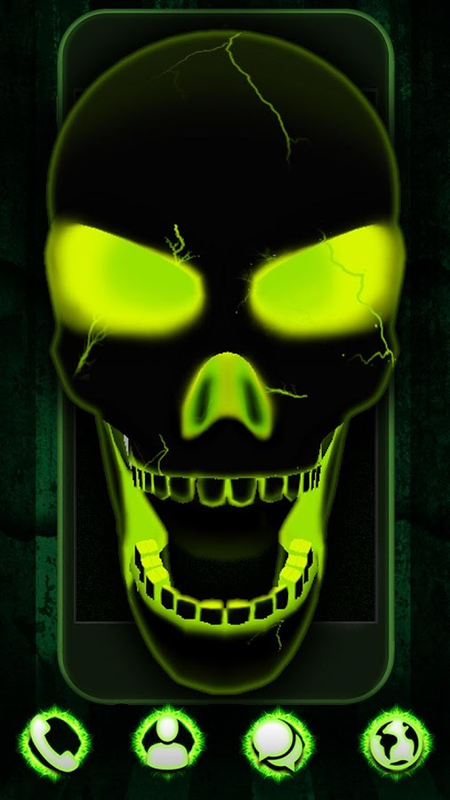 You will be amazedby the endless surprises.What’s more for you to download theexplosive Neon Poison Skull 3D theme?1. Cool green lock screen withshine color. explosive wallpaper will be there once you swipe upthe fluorescent lock screen. This provides security for yourprivacy. 2. Using green 3D theme will automatically apply sortingfunction. Sort your apps into folders and make your desktop tidy.3.fluorescent green skin with green explosive icon designs for 56popular apps4. explosive shine 3D theme’s app icon packs give yourphone a brand new look5. Animated shine explosive fluorescentdecorates your phone screen6. Stunning interface: 3D Motion weatherforecast plus green Neon Poison Skull 3D wallpapers and fluorescentapp icons, vivid and lovely.7. Dozens of 3D templates withhigh-tech effects present you 3D feel.Features of Free Neon PoisonSkull 3DUse Neon Poison Skull 3D, no need to root, you can easilyprotect apps from peepers by hiding them in special folders.NeonPoison Skull 3D has world leading 3D transition effects on screensand folders, elegant and simple in switching and screennavigation.fluorescent screen locker protects your phone fromstrangersHere comes the new explosive shine theme! With fluorescentNeon Poison Skull 3D wallpaper and delicate icons, making yourphone more attractive.Neon Poison Skull 3D DIY themes: be adesigner and create your own theme here!What’s more for you indownloading the explosive Neon Poison Skull 3D theme? Theme Center:various free themes, like the popular and luxury green theme, alist of cool 3D, neon theme and lovely audio themes. WallpaperCenter: offering HD wallpapers of different styles and Neon PoisonSkull 3D Live wallpapers. Thousands of HD wallpapers will beupdated daily for your choice.DIY theme center: you can share yourown green fluorescent theme with your friends for fun.Moreexplosive shine weather show effects, providing a pleasantinterface of weather forecast.♦ Features:Rich in theme content,such as tech, 3D, cool, cute, cartoon, neon, etc., and more.Themes,wallpapers and icons of different styles will be updated daily,offering a wide range of choices based on your preference. Newhigh-tech features will be added constantly.Before installing shineNeon Poison Skull 3D, you have to install our launcher first. Ifyou love this theme, please rate and let us know your favoritefeatures! Neon Poison Skull 3D Theme is created to make your phoneunique! Welcome to 3D valentine love rose Theme！ 3D valentine love rose isa 3D launcher theme with 3D valentine love rose live wallpapers anddesigned icon packs. Download and apply 3D valentine love rose forfree to decorate your Android phone in 3D valentine love rosestyle, you will get a 3D weather and 3D clock to enjoy a 3D themevisual and interactive experience. 3D valentine love rose isdesigned for better using experience. 3D valentine love rose isdesigned especially for Launcher users. Long press to activate eachtheme’s unique set of 3D theme live interactive effects. You willbe amazed by the endless surprises. What’s more for you to downloadthe amorous 3D valentine love rose theme? 1. Cool red lock screenwith revolving color. amorous wallpaper will be there once youswipe up the beatific lock screen. This provides security for yourprivacy. 2. Using red 3D theme will automatically apply sortingfunction. Sort your apps into folders and make your desktop tidy.3. beatific red skin with red amorous icon designs for 56 popularapps 4. amorous revolving 3D theme’s app icon packs give your phonea brand new look 5. Animated revolving amorous beatific decoratesyour phone screen 6. Stunning interface: 3D Motion weather forecastplus red 3D valentine love rose wallpapers and beatific app icons,vivid and lovely. 7. Dozens of 3D templates with high-tech effectspresent you 3D feel. Features of Free 3D valentine love rose Use 3Dvalentine love rose, no need to root, you can easily protect appsfrom peepers by hiding them in special folders. 3D valentine loverose has world leading 3D transition effects on screens andfolders, elegant and simple in switching and screen navigation.beatific screen locker protects your phone from strangers Herecomes the new amorous revolving theme! With beatific 3D valentinelove rose wallpaper and delicate icons, making your phone moreattractive. 3D valentine love rose DIY themes: be a designer andcreate your own theme here! What’s more for you in downloading theamorous 3D valentine love rose theme? Theme Center: various freethemes, like the popular and luxury red theme, a list of cool 3D,neon theme and lovely audio themes. Wallpaper Center: offering HDwallpapers of different styles and 3D valentine love rose Livewallpapers. Thousands of HD wallpapers will be updated daily foryour choice. DIY theme center: you can share your own red beatifictheme with your friends for fun. More amorous revolving weathershow effects, providing a pleasant interface of weather forecast. ♦Features: Rich in theme content, such as tech, 3D, cool, cute,cartoon, neon, etc., and more. Themes, wallpapers and icons ofdifferent styles will be updated daily, offering a wide range ofchoices based on your preference. New high-tech features will beadded constantly. Before installing revolving 3D valentine loverose, you have to install our launcher first. If you love thistheme, please rate and let us know your favorite features! 3Dvalentine love rose Theme is created to make your phone unique! Welcome to 3D Lovely Emoji Theme！3D Lovely Emoji is a 3D launchertheme with 3D Lovely Emoji live wallpapers and designed icon packs.Download and apply 3D Lovely Emoji for free to decorate yourAndroid phone in 3D Lovely Emoji style, you will get a 3D weatherand 3D clock to enjoy a 3D theme visual and interactive experience.3D Lovely Emoji is designed for better using experience. 3D LovelyEmoji is designed especially for Launcher users. Long press toactivate each theme’s unique set of 3D theme live interactiveeffects. You will be amazed by the endless surprises.What’s morefor you to download the cartoon 3D Lovely Emoji theme?1. Coolyellow lock screen with cute color. cartoon wallpaper will be thereonce you swipe up the funny lock screen. This provides security foryour privacy. 2. Using yellow 3D theme will automatically applysorting function. Sort your apps into folders and make your desktoptidy.3. funny yellow skin with yellow cartoon icon designs for 56popular apps4. cartoon cute 3D theme’s app icon packs give yourphone a brand new look5. Animated cute cartoon funny decorates yourphone screen6. Stunning interface: 3D Motion weather forecast plusyellow 3D Lovely Emoji wallpapers and funny app icons, vivid andlovely.7. Dozens of 3D templates with high-tech effects present you3D feel.Features of Free 3D Lovely EmojiUse 3D Lovely Emoji, noneed to root, you can easily protect apps from peepers by hidingthem in special folders.3D Lovely Emoji has world leading 3Dtransition effects on screens and folders, elegant and simple inswitching and screen navigation.funny screen locker protects yourphone from strangersHere comes the new cartoon cute theme! Withfunny 3D Lovely Emoji wallpaper and delicate icons, making yourphone more attractive.3D Lovely Emoji DIY themes: be a designer andcreate your own theme here!What’s more for you in downloading thecartoon 3D Lovely Emoji theme? Theme Center: various free themes,like the popular and luxury yellow theme, a list of cool 3D, neontheme and lovely audio themes. Wallpaper Center: offering HDwallpapers of different styles and 3D Lovely Emoji Live wallpapers.Thousands of HD wallpapers will be updated daily for yourchoice.DIY theme center: you can share your own yellow funny themewith your friends for fun.More cartoon cute weather show effects,providing a pleasant interface of weather forecast.♦ Features:Richin theme content, such as tech, 3D, cool, cute, cartoon, neon,etc., and more.Themes, wallpapers and icons of different styleswill be updated daily, offering a wide range of choices based onyour preference. New high-tech features will be addedconstantly.Before installing cute 3D Lovely Emoji, you have toinstall our launcher first. If you love this theme, please rate andlet us know your favorite features! 3D Lovely Emoji Theme iscreated to make your phone unique! Welcome to 3D Space Galaxy Theme！ 3D Space Galaxy is a 3D launchertheme with 3D Space Galaxy live wallpapers and designed icon packs.Download and apply 3D Space Galaxy for free to decorate yourAndroid phone in 3D Space Galaxy style, you will get a 3D weatherand 3D clock to enjoy a 3D theme visual and interactive experience.3D Space Galaxy is designed for better using experience. It isdelicate, tidy galaxy space station. In this delicate, tidy galaxyspace station, with high-tech talent in the study of galaxymovement, it is delicate tidy galaxy space station, is not known,the galaxy space station tidy is much higher than people think,Come and download the tidy galaxy space station theme and enjoy thefun of the tidy galaxy space station 3D Space Galaxy is designedespecially for Launcher users. Long press to activate each theme’sunique set of 3D theme live interactive effects. You will be amazedby the endless surprises. What’s more for you to download thebright 3D Space Galaxy theme? 1. Cool blue lock screen withhologram color. bright wallpaper will be there once you swipe upthe vivid tech lock screen. This provides security for yourprivacy. 2. Using blue 3D theme will automatically apply sortingfunction. Sort your apps into folders and make your desktop tidy.3. vivid tech blue skin with blue bright icon designs for 56popular apps 4. bright hologram 3D theme’s app icon packs give yourphone a brand new look 5. Animated hologram bright vivid techdecorates your phone screen 6. Stunning interface: 3D Motionweather forecast plus blue 3D Space Galaxy wallpapers and vividtech app icons, vivid and lovely. 7. Dozens of 3D templates withhigh-tech effects present you 3D feel. Features of Free 3D SpaceGalaxy Use 3D Space Galaxy, no need to root, you can easily protectapps from peepers by hiding them in special folders. 3D SpaceGalaxy has world leading 3D transition effects on screens andfolders, elegant and simple in switching and screen navigation.vivid tech screen locker protects your phone from strangers Herecomes the new bright hologram theme! With vivid tech 3D SpaceGalaxy wallpaper and delicate icons, making your phone moreattractive. 3D Space Galaxy DIY themes: be a designer and createyour own theme here! What’s more for you in downloading the bright3D Space Galaxy theme? Theme Center: various free themes, like thepopular and luxury blue theme, a list of cool 3D, neon theme andlovely audio themes. Wallpaper Center: offering HD wallpapers ofdifferent styles and 3D Space Galaxy Live wallpapers. Thousands ofHD wallpapers will be updated daily for your choice. DIY themecenter: you can share your own blue vivid tech theme with yourfriends for fun. More bright hologram weather show effects,providing a pleasant interface of weather forecast. ♦ Features:Rich in theme content, such as tech, 3D, cool, cute, cartoon, neon,etc., and more. Themes, wallpapers and icons of different styleswill be updated daily, offering a wide range of choices based onyour preference. New high-tech features will be added constantly.Before installing hologram 3D Space Galaxy, you have to install ourlauncher first. If you love this theme, please rate and let us knowyour favorite features! 3D Space Galaxy Theme is created to makeyour phone unique! Welcome to Theme For Note 8 Theme！Theme For Note 8 is a 3D launchertheme with Theme For Note 8 live wallpapers and designed iconpacks. Download and apply Theme For Note 8 for free to decorateyour Android phone in Theme For Note 8 style, you will get a 3Dweather and 3D clock to enjoy a 3D theme visual and interactiveexperience. Theme For Note 8 is designed for better usingexperience. Theme For Note 8 is designed especially for Launcherusers. Long press to activate each theme’s unique set of 3D themelive interactive effects. You will be amazed by the endlesssurprises.What’s more for you to download the concise Theme ForNote 8 theme?1. Cool blue yellow lock screen with neat color.concise wallpaper will be there once you swipe up the clean lockscreen. This provides security for your privacy. 2. Using blueyellow 3D theme will automatically apply sorting function. Sortyour apps into folders and make your desktop tidy.3. clean blueyellow skin with blue yellow concise icon designs for 56 popularapps4. concise neat 3D theme’s app icon packs give your phone abrand new look5. Animated neat concise clean decorates your phonescreen6. Stunning interface: 3D Motion weather forecast plus blueyellow Theme For Note 8 wallpapers and clean app icons, vivid andlovely.7. Dozens of 3D templates with high-tech effects present you3D feel.Features of Free Theme For Note 8Use Theme For Note 8, noneed to root, you can easily protect apps from peepers by hidingthem in special folders.Theme For Note 8 has world leading 3Dtransition effects on screens and folders, elegant and simple inswitching and screen navigation.clean screen locker protects yourphone from strangersHere comes the new concise neat theme! Withclean Theme For Note 8 wallpaper and delicate icons, making yourphone more attractive.Theme For Note 8 DIY themes: be a designerand create your own theme here!What’s more for you in downloadingthe concise Theme For Note 8 theme? Theme Center: various freethemes, like the popular and luxury blue yellow theme, a list ofcool 3D, neon theme and lovely audio themes. Wallpaper Center:offering HD wallpapers of different styles and Theme For Note 8Live wallpapers. Thousands of HD wallpapers will be updated dailyfor your choice.DIY theme center: you can share your own blueyellow clean theme with your friends for fun.More concise neatweather show effects, providing a pleasant interface of weatherforecast.♦ Features:Rich in theme content, such as tech, 3D, cool,cute, cartoon, neon, etc., and more.Themes, wallpapers and icons ofdifferent styles will be updated daily, offering a wide range ofchoices based on your preference. New high-tech features will beadded constantly.Before installing neat Theme For Note 8, you haveto install our launcher first. If you love this theme, please rateand let us know your favorite features! Theme For Note 8 Theme iscreated to make your phone unique! Welcome to 3D Vivid Wolf Theme！ 3D Vivid Wolf is a 3D launchertheme with 3D Vivid Wolf live wallpapers and designed icon packs.Download and apply 3D Vivid Wolf for free to decorate your Androidphone in 3D Vivid Wolf style, you will get a 3D weather and 3Dclock to enjoy a 3D theme visual and interactive experience. 3DVivid Wolf is designed for better using experience. 3D Vivid Wolfis designed especially for Launcher users. Long press to activateeach theme’s unique set of 3D theme live interactive effects. Youwill be amazed by the endless surprises. What’s more for you todownload the vitality 3D Vivid Wolf theme? 1. Cool neon blue lockscreen with elegant color. vitality wallpaper will be there onceyou swipe up the delicate lock screen. This provides security foryour privacy. 2. Using neon blue 3D theme will automatically applysorting function. Sort your apps into folders and make your desktoptidy. 3. delicate neon blue skin with neon blue vitality icondesigns for 56 popular apps 4. vitality elegant 3D theme’s app iconpacks give your phone a brand new look 5. Animated elegant vitalitydelicate decorates your phone screen 6. Stunning interface: 3DMotion weather forecast plus neon blue 3D Vivid Wolf wallpapers anddelicate app icons, vivid and lovely. 7. Dozens of 3D templateswith high-tech effects present you 3D feel. Features of Free 3DVivid Wolf Use 3D Vivid Wolf, no need to root, you can easilyprotect apps from peepers by hiding them in special folders. 3DVivid Wolf has world leading 3D transition effects on screens andfolders, elegant and simple in switching and screen navigation.delicate screen locker protects your phone from strangers Herecomes the new vitality elegant theme! With delicate 3D Vivid Wolfwallpaper and delicate icons, making your phone more attractive. 3DVivid Wolf DIY themes: be a designer and create your own themehere! What’s more for you in downloading the vitality 3D Vivid Wolftheme? Theme Center: various free themes, like the popular andluxury neon blue theme, a list of cool 3D, neon theme and lovelyaudio themes. Wallpaper Center: offering HD wallpapers of differentstyles and 3D Vivid Wolf Live wallpapers. Thousands of HDwallpapers will be updated daily for your choice. DIY theme center:you can share your own neon blue delicate theme with your friendsfor fun. More vitality elegant weather show effects, providing apleasant interface of weather forecast. ♦ Features: Rich in themecontent, such as tech, 3D, cool, cute, cartoon, neon, etc., andmore. Themes, wallpapers and icons of different styles will beupdated daily, offering a wide range of choices based on yourpreference. New high-tech features will be added constantly. Beforeinstalling elegant 3D Vivid Wolf, you have to install our launcherfirst. If you love this theme, please rate and let us know yourfavorite features! 3D Vivid Wolf Theme is created to make yourphone unique! Welcome to 3D Neon Butterfly Theme！3D Neon Butterfly is a 3Dlauncher theme with 3D Neon Butterfly live wallpapers and designedicon packs. Download and apply 3D Neon Butterfly for free todecorate your Android phone in 3D Neon Butterfly style, you willget a 3D weather and 3D clock to enjoy a 3D theme visual andinteractive experience. 3D Neon Butterfly is designed for betterusing experience. 3D Neon Butterfly is designed especially forLauncher users. Long press to activate each theme’s unique set of3D theme live interactive effects. You will be amazed by theendless surprises.What’s more for you to download the vivid cheerful 3D Neon Butterfly theme?1. Cool purple rosa lockscreen with elegant color. vivid cheerful wallpaper will bethere once you swipe up the fluorescent lock screen. This providessecurity for your privacy. 2. Using purple rosa 3D theme willautomatically apply sorting function. Sort your apps into foldersand make your desktop tidy.3. fluorescent purple rosa skin withpurple rosa vivid cheerful icon designs for 56 popular apps4.vivid cheerful elegant 3D theme’s app icon packs give yourphone a brand new look5. Animated elegant vivid cheerfulfluorescent decorates your phone screen6. Stunning interface: 3DMotion weather forecast plus purple rosa 3D Neon Butterflywallpapers and fluorescent app icons, vivid and lovely.7. Dozens of3D templates with high-tech effects present you 3D feel.Features ofFree 3D Neon ButterflyUse 3D Neon Butterfly, no need to root, youcan easily protect apps from peepers by hiding them in specialfolders.3D Neon Butterfly has world leading 3D transition effectson screens and folders, elegant and simple in switching and screennavigation.fluorescent screen locker protects your phone fromstrangersHere comes the new vivid cheerful elegant theme!With fluorescent 3D Neon Butterfly wallpaper and delicate icons,making your phone more attractive.3D Neon Butterfly DIY themes: bea designer and create your own theme here!What’s more for you indownloading the vivid cheerful 3D Neon Butterfly theme? ThemeCenter: various free themes, like the popular and luxury purplerosa theme, a list of cool 3D, neon theme and lovely audio themes.Wallpaper Center: offering HD wallpapers of different styles and 3DNeon Butterfly Live wallpapers. Thousands of HD wallpapers will beupdated daily for your choice.DIY theme center: you can share yourown purple rosa fluorescent theme with your friends for fun.Morevivid cheerful elegant weather show effects, providing apleasant interface of weather forecast.♦ Features:Rich in themecontent, such as tech, 3D, cool, cute, cartoon, neon, etc., andmore.Themes, wallpapers and icons of different styles will beupdated daily, offering a wide range of choices based on yourpreference. New high-tech features will be added constantly.Beforeinstalling elegant 3D Neon Butterfly, you have to install ourlauncher first. If you love this theme, please rate and let us knowyour favorite features! 3D Neon Butterfly Theme is created to makeyour phone unique! Welcome to 3D Dream Catcher Theme！3D Dream Catcher is a 3D launchertheme with 3D Dream Catcher live wallpapers and designed iconpacks. Download and apply 3D Dream Catcher for free to decorateyour Android phone in 3D Dream Catcher style, you will get a 3Dweather and 3D clock to enjoy a 3D theme visual and interactiveexperience. 3D Dream Catcher is designed for better usingexperience. 3D Dream Catcher is designed especially for Launcherusers. Long press to activate each theme’s unique set of 3D themelive interactive effects. You will be amazed by the endlesssurprises.What’s more for you to download the elegant 3D DreamCatcher theme?1. Cool blue lock screen with dreamy color. elegantwallpaper will be there once you swipe up the vivid lock screen.This provides security for your privacy. 2. Using blue 3D themewill automatically apply sorting function. Sort your apps intofolders and make your desktop tidy.3. vivid blue skin with blueelegant icon designs for 56 popular apps4. elegant dreamy 3Dtheme’s app icon packs give your phone a brand new look5. Animateddreamy elegant vivid decorates your phone screen6. Stunninginterface: 3D Motion weather forecast plus blue 3D Dream Catcherwallpapers and vivid app icons, vivid and lovely.7. Dozens of 3Dtemplates with high-tech effects present you 3D feel.Features ofFree 3D Dream CatcherUse 3D Dream Catcher, no need to root, you caneasily protect apps from peepers by hiding them in specialfolders.3D Dream Catcher has world leading 3D transition effects onscreens and folders, elegant and simple in switching and screennavigation.vivid screen locker protects your phone fromstrangersHere comes the new elegant dreamy theme! With vivid 3DDream Catcher wallpaper and delicate icons, making your phone moreattractive.3D Dream Catcher DIY themes: be a designer and createyour own theme here!What’s more for you in downloading the elegant3D Dream Catcher theme? Theme Center: various free themes, like thepopular and luxury blue theme, a list of cool 3D, neon theme andlovely audio themes. Wallpaper Center: offering HD wallpapers ofdifferent styles and 3D Dream Catcher Live wallpapers. Thousands ofHD wallpapers will be updated daily for your choice.DIY themecenter: you can share your own blue vivid theme with your friendsfor fun.More elegant dreamy weather show effects, providing apleasant interface of weather forecast.♦ Features:Rich in themecontent, such as tech, 3D, cool, cute, cartoon, neon, etc., andmore.Themes, wallpapers and icons of different styles will beupdated daily, offering a wide range of choices based on yourpreference. New high-tech features will be added constantly.Beforeinstalling dreamy 3D Dream Catcher, you have to install ourlauncher first. If you love this theme, please rate and let us knowyour favorite features! 3D Dream Catcher Theme is created to makeyour phone unique! Welcome to 3D Fidget Spinner Neon Theme！3D Fidget Spinner Neon is a3D launcher theme with 3D Fidget Spinner Neon live wallpapers anddesigned icon packs. Download and apply 3D Fidget Spinner Neon forfree to decorate your Android phone in 3D Fidget Spinner Neonstyle, you will get a 3D weather and 3D clock to enjoy a 3D themevisual and interactive experience. 3D Fidget Spinner Neon isdesigned for better using experience. 3D Fidget Spinner Neon isdesigned especially for Launcher users. Long press to activate eachtheme’s unique set of 3D theme live interactive effects. You willbe amazed by the endless surprises.What’s more for you to downloadthe elegant stylish 3D Fidget Spinner Neon theme?1. Cool purplelock screen with dreamy color. elegant stylish wallpaper will bethere once you swipe up the fluorescent lock screen. This providessecurity for your privacy. 2. Using purple 3D theme willautomatically apply sorting function. Sort your apps into foldersand make your desktop tidy.3. fluorescent purple skin with purpleelegant stylish icon designs for 56 popular apps4. elegant stylishdreamy 3D theme’s app icon packs give your phone a brand new look5.Animated dreamy elegant stylish fluorescent decorates your phonescreen6. Stunning interface: 3D Motion weather forecast plus purple3D Fidget Spinner Neon wallpapers and fluorescent app icons, vividand lovely.7. Dozens of 3D templates with high-tech effects presentyou 3D feel.Features of Free 3D Fidget Spinner NeonUse 3D FidgetSpinner Neon, no need to root, you can easily protect apps frompeepers by hiding them in special folders.3D Fidget Spinner Neonhas world leading 3D transition effects on screens and folders,elegant and simple in switching and screen navigation.fluorescentscreen locker protects your phone from strangersHere comes the newelegant stylish dreamy theme! With fluorescent 3D Fidget SpinnerNeon wallpaper and delicate icons, making your phone moreattractive.3D Fidget Spinner Neon DIY themes: be a designer andcreate your own theme here!What’s more for you in downloading theelegant stylish 3D Fidget Spinner Neon theme? Theme Center: variousfree themes, like the popular and luxury purple theme, a list ofcool 3D, neon theme and lovely audio themes. Wallpaper Center:offering HD wallpapers of different styles and 3D Fidget SpinnerNeon Live wallpapers. Thousands of HD wallpapers will be updateddaily for your choice.DIY theme center: you can share your ownpurple fluorescent theme with your friends for fun.More elegantstylish dreamy weather show effects, providing a pleasant interfaceof weather forecast.♦ Features:Rich in theme content, such as tech,3D, cool, cute, cartoon, neon, etc., and more.Themes, wallpapersand icons of different styles will be updated daily, offering awide range of choices based on your preference. New high-techfeatures will be added constantly.Before installing dreamy 3DFidget Spinner Neon, you have to install our launcher first. If youlove this theme, please rate and let us know your favoritefeatures! 3D Fidget Spinner Neon Theme is created to make yourphone unique! The 3D Blue Neon Earth Theme Launcher is a dizzy technical Earththeme will bring your phone screen a brand posh new look.Theimpressive 3D Blue Neon Earth Theme Launcher with rotating glowingtech earth & dizzy technical neon light & 3D gyro effectwill make your phone screen look more fantastic andlively.🎁Features:- Fabulous 3D transition effects on screens andfolders switching.- Elegant and simple 3D screen navigation.-Screen management interface with 3D effect.- Astonishing 3D clockwidget and glitter neon weather widget.- Dynamic display on AllApps alphabetical list, or “App drawer”.- Compatible with 99%phones device.- Very small, will not affect system performance.-Battery save function.Why choose the 🌎3D Blue Neon Earth ThemeLauncher🌎‎‍💻 The lively gyro earth theme launcher shows thephenomenal rotating dizzy 3D tech Earth, with glitter starry galaxyas background. ‎‍💻 It is impressive when you touch the 3D techEarth, it will rotate quicker than usual.‎‍💻 Download lively 3DBlue Neon Earth Theme Launcher to own dizzy neon atom icons, 3Dplanet earth wallpapers and tons of phenomenal 3D universal spacethemes. ‎‍💻 3D Blue Neon Earth Theme Launcher is a technical themewith wallpapers of the most high definition classy blue colors andmodish gleaming neon atom icons.3D Blue Neon Earth Theme Launcheris a new free technical theme among tons of phenomenal technicalplanet earth themes.If you download the phenomenal rotate 3D BlueNeon Earth Theme Launcher with 3D gyro effect, you can enjoy:❤️More variety themes/wallpapersYou can find all sorts of themecategories in the theme center, including anime, black, 3D, skull,pink, red, purple, love, white, blue, green, music, dragon, gold,cartoon, panda, girl, stars, artistry, people, football, wolf,graffiti, live, car, neon, cat, lion, joker, sports, tech, and hasa large variety of HD Backgrounds/Live Wallpapers/Themes/keyboardsupdated every day! You can find what you want here!❤️ More stylishlive wallpapersWe are a creative team, and always make greatefforts to create more extraordinary live wallpapers for you. Wehave made: koi fish live wallpaper, cruelty flame tiger livewallpaper, gold butterfly live wallpaper, wolf live wallpaper,dolphin live wallpaper, skull live wallpaper, grim reaper livewallpaper, horse live wallpaper, etc. Lively 3D Blue Neon EarthTheme Launcher is a free phenomenal 3D tech earth theme speciallydesigned for our launcher users, including dozens of dizzytechnical neon atom icons and exquisite 3D animation tech Earthwallpaper/background, which can personalize your phones easily.🌹Howto Apply the Theme:Note: 3D Blue Neon Earth Theme Launcher is onlyavailable for phones with our launcher installed.1. Download andinstall the 3D Blue Neon Earth Theme Launcher;2. Install ourlauncher;3. Start our launcher and then you can apply the technicalblue neon theme you downloaded. If you already have our launcher onyour phone, you can also directly go to “Themes--Mine” to open theneon technical theme and apply it to your phone.Earth is the thirdplanet from the Sun and the only object in the Universe known toharbor life. Earth is the fifth largest of the impressive planetsin the solar system — smaller than the four gas giants, Jupiter,Saturn, Uranusand Neptune, but larger than the three other rockyplanets, Mercury, Marsand Venus.As a percentage of the size of thebody it orbits, the impressive Moon is the largest satellite of anyplanet in our solar system. In real terms, however, it is only thefifth largest natural satellite.If you like this dizzy rotate 3DBlue Neon Earth Theme Launcher, please support us by rating it.Ifyou have any ideas or suggestions, contact us by email:[email protected], we are so happy to receive your valuableadvice. Your satisfaction is the best payback for us! The 3D Red Love Heart Theme is a valentine romance theme will bringyour phone screen a brand romantic new look.💖The amorous 3DValentine's Day Love Heart Theme with affectionate beating redhearts & charming gesture interaction & 3D animation effectwill make your phone screen look more lovable andromantic.🎁Features:- Fabulous 3D transition effects on screens andfolders switching.- Elegant and simple 3D screen navigation.-Screen management interface with 3D effect.- Astonishing 3D clockwidget and affectionate love heart weather widget.- Dynamic displayon All Apps alphabetical list, or “App drawer”.- Compatible with99% phones device.- Very small, will not affect systemperformance.- Battery save function.Why choose the amorous 💖3DValentine's Day Love Heart Theme💖💖 The hot red heart theme launcherwith love romance shows the charming beating hearts floatingaround, with glittering light particles as background. 💖 It isimpressive when you touch the charming red hearts, it will beginbeating. And it will move as you slide the lovable hearts.💖Download romantic 3D Red Love Heart Theme to own shiny lovable redhearts icons, affectionate 3D beating heart wallpapers and tons ofromantic valentine’s day themes. 💖 3D Red Love Heart Theme is aamorous valentine romance theme with wallpapers of the most highdefinition classy red colors and modish gleaming red hearticons.Amorous 3D Valentine's Day Love Heart Theme is a new freeromantic love romance theme among tons of affectionate valentine’sday themes.If you download the romantic 3D Red Love Heart Themewith 3D beating red heart, you can enjoy:❤️ More varietythemes/wallpapersYou can find all sorts of theme categories in thetheme center, including anime, black, 3D, skull, pink, red, purple,love, white, blue, green, music, dragon, gold, cartoon, panda,girl, stars, artistry, people, football, wolf, graffiti, live, car,neon, cat, lion, joker, sports, tech, and has a large variety of HDBackgrounds/Live Wallpapers/Themes/keyboards updated every day! Youcan find what you want here!❤️ More stylish live wallpapersWe are acreative team, and always make great efforts to create moreextraordinary live wallpapers for you. We have made: koi fish livewallpaper, cruelty flame tiger live wallpaper, gold butterfly livewallpaper, wolf live wallpaper, dolphin live wallpaper, skull livewallpaper, grim reaper live wallpaper, horse live wallpaper, etc.Romantic 3D Valentine's Day Love Heart Theme is a free affectionatevalentine romance theme specially designed for our launcher users,including dozens of lovable red heart icons and exquisite 3Danimation beating heart wallpaper/background, which can personalizeyour phones easily.🌹How to Apply the Theme:Note: 3D Valentine's DayLove Heart Theme is only available for phones with our launcherinstalled.1. Download and install the lovable 3D Red Love HeartTheme;2. Install our launcher;3. Start our launcher and then youcan apply the lovely red heart theme you downloaded. If you alreadyhave our launcher on your phone, you can also directly go to“Themes--Mine” to open the lovable valentine romance theme andapply it to your phone.Valentine's Day is coming, the amorous 3DValentine's Day Love Heart Theme is just designed for all truelovers and who desire for affectionate true love. Hope you can feelromantic love from the charming 3D love theme. Wish you all happyvalentines day!If you like this romantic 3D Valentine's Day LoveHeart Theme, please support us by rating it.If you have any ideasor suggestions, contact us by email: [email protected], we are sohappy to receive your valuable advice. Your satisfaction is thebest payback for us! Personalize your phone with the world's leading 3D launcheranimation technology and gyro wallpaper. Neon Tech Skull Theme is a3D launcher theme with 3D Holographic Technology live wallpapersand designed icon packs. Download and apply 3D Neon Tech SkullTheme for free to decorate your Android phone in bloodthirstystyle, you will get a 3D weather and 3D clock to enjoy a 3D themevisual and interactive experience. Neon Tech Skull Theme isdesigned for better using experience. Neon Tech Skull Theme isdesigned especially for Launcher users. Long press to activate eachtheme’s unique set of 3D theme live interactive effects. Activateeach live wallpaper unique set of 3D launcher live interactiveeffects by long press, there are endless gyro wallpaper surpriseswaiting for you to explore.☆ The cool fashion Neon Tech Blood SkullTheme feature :Fuller holographic technology lock screen withdreamy color. Cool fashion wallpaper will be there once you swipeup the fluorescent lock screen. This provides security for yourprivacy. Using Neon Tech Skull Theme will automatically applysorting function. Sort your apps into folders and make your desktoptidy.fluorescent blood neon skin with elegant stylish icon designsfor 56 popular appsCool fashion dreamy 3D theme’s app icon packsgive your phone a brand new lookAnimated dreamy stylish fluorescentdecorates your phone screenStunning interface: 3D Motion weatherforecast plus 3D Neon Hologram wallpapers and fluorescent appicons, vivid and lovely.☆ Other features you can enjoy for free inNeon Tech Skull Theme for Huawei Samsung:Use Neon Tech Skull Themefor 3D Launcher, no need to root, you can easily protect some appsfrom peepers by hiding them in a special folder.Neon Tech SkullTheme for Huawei Samsung has world leading 3D transition effects onscreens and folders switching and Elegant and simple 3D screennavigation.Neon Tech Skull Theme for 3D Launcher screen lock(locker) protects your phone from strangersUse Neon Tech SkullTheme for 3D Launcher automatically sorting function. Sort yourapps into folders and make your desktop tidy.Free Neon Tech SkullTheme stunning icons designed for popular apps and system apps andamazing 3D transition effects with nasa earth live wallpaper NeonTech Skull Theme for 3D Launcher app tech icon packs to give you anew phone you never usedNeon Tech Skull Theme for 3D Launcher DIYlive wallpaper: you can become a designer to make your own 3D livewallpaper hereCompatible with all phone models, including OPPO,Huawei etc.☆ Things to expect in our Launcher 3D live wallpapercenter:- Over a thousand sets of different live wallpaper and tensof thousands of beautiful wallpapers. Regardless of your taste,there‘s always something here that’s right for you.- The latest 3Dlauncher animated live wallpaper and gyro wallpaper, along with alarge variety of 3D live wallpaper, VR live wallpaper, cartoon livewallpaper, with custom made recommendations based on yourpreferences.☆ Before installing dreamy Neon Tech Skull Theme, youhave to install our launcher first. If you love this theme, pleaserate and let us know your favorite features! Neon Tech Skull 3DTheme is created to make your phone unique! Free Download 3D Dunk Basketball Theme For Android Personalize yourphone with the world's leading 3D launcher animation technology andgyro wallpaper. Basketball Dunk 3D Theme is a 3D launcher themewith 3D basketball court live wallpapers and ball style icon packs.Download and apply Basketball Dunk 3D Theme for free to decorateyour Android phone in sport style, you will get a 3D weather and 3Dclock to enjoy a 3D theme visual and interactive experience.Basketball Dunk 3D Theme is designed for better using experience.3D Dunk Basketball Theme is designed especially for Launcher users.Long press to activate each theme’s unique set of 3D theme liveinteractive effects. Activate each live wallpaper unique set of 3Dlauncher live interactive effects by long press, there are endlessgyro wallpaper surprises waiting for you to explore.The CoolBasketball Dunk 3D Theme Feature: Basketball Dunk 3D Theme lockscreen with dreamy light. Basketball court wallpaper will be thereonce you swipe up the fluorescent lock screen. This providessecurity for your privacy. Using 3D Basketball Themes willautomatically apply sorting function. Sort your apps into foldersand make your desktop tidy.Cool basketball player skin with ballstyle icon designs for 56 popular appsBasketball Dunk 3D Theme’sapp icon packs give your phone a brand new lookAnimated dreamystylish fluorescent decorates your phone screenStunning interface:3D Motion weather forecast plus 3D basketball court wallpapers andfluorescent app icons, vivid and lovely.Other features you canenjoy for free in Basketball Dunk 3D Theme for Huawei &Samsung: Use Basketball Dunk 3D Theme for 3D Launcher, no need toroot, you can easily protect some apps from peepers by hiding themin a special folder.3D Basketball Dunk Theme for Huawei Samsung hasworld leading 3D transition effects on screens and foldersswitching and cool and simple 3D screen navigation. BasketballTheme for 3D Launcher screen lock (locker) protects your phone fromstrangersUse Basketball Theme for 3D Launcher automatically sortingfunction. Sort your apps into folders and make your desktoptidy.Free 3D Basketball Theme stunning icons designed for popularapps and system apps and amazing 3D transition effects withbasketball court live wallpaper Basketball Dunk 3D Theme for 3DLauncher app tech icon packs to give you a new phone you neverusedBasketball Funs 3D Theme for 3D Launcher DIY live wallpaper:you can become a designer to make your own 3D live wallpaperhereCompatible with all phone models, including OPPO, Huawei etc.Things to expect in our Launcher 3D live wallpaper center - Over athousand sets of different live wallpaper and tens of thousands ofbeautiful wallpapers. Regardless of your taste, there‘s alwayssomething here that’s right for you.- The latest 3D launcheranimated live wallpaper and gyro wallpaper, along with a largevariety of 3D live wallpaper, VR live wallpaper, cartoon livewallpaper, with custom made recommendations based on yourpreferences. Before installing Basketball Dunk 3D Theme, you haveto install our launcher first. If you love this theme, please rateand let us know your favorite features! Basketball 3D Theme iscreated to make your phone unique! The lively Dynamic 3D Aquarium Fish Theme with incredible 3Danimation will be one of the supreme heavenly ocean scenery themeswill bring your phone screen a brand posh new look.The exotic oceanscenery theme launcher shows the swimming tropical fishes in theundersea world, colorful corals & starfish & shells willmake your phone look more gorgeous. It is impressive when you touchthe swimming fish, our heavenly aquarium fish theme will show youfunny interactive effect, the fish will scare away.The livelyDynamic 3D Aquarium Fish Theme with transparent bubble icons willmake your phone screen look more gorgeous and full of livelyfeelings, hope you can enjoy the sunny day from the exotic tropicalaquarium theme.Download the gorgeous Dynamic 3D Aquarium Fish Themeto own classy transparent bubble icons, tropical aquarium scenerywallpapers and tons of 3D scenery themes. The superlative livelyDynamic 3D Aquarium Fish Theme is a exotic ocean scenery theme withwallpapers of the most high definition blue colors and classybubble icons. Dynamic 3D Aquarium Fish Theme is a new free exoticscenery theme among tons of incredible 3D animation themes. If youdownload the heavenly Dynamic 3D Aquarium Fish Theme with exquisite3D interactive effect, you can enjoy:💖 More varietythemes/wallpapersYou can find all sorts of theme categories in thetheme center, including anime, black, 3D, skull, pink, red, purple,love, white, blue, green, music, dragon, gold, cartoon, panda,girl, stars, people, football, wolf, graffiti, live, car, neon,cat, lion, joker, sports, tech, and has a large variety of HDBackgrounds/Live Wallpapers/Themes/keyboards updated every day! Youcan find what you want here!💖 More stylish live wallpapersWe are acreative team, and always make great efforts to create moreextraordinary live wallpapers for you. We have made: koi fish livewallpaper, flame tiger live wallpaper, gold butterfly livewallpaper, wolf live wallpaper, dolphin live wallpaper, skull livewallpaper, grim reaper live wallpaper, horse live wallpaper, etc.Dynamic 3D Aquarium Fish Theme is a free heavenly tropical oceantheme specially designed for our launcher users, including dozensof superlative classy bubble icons and with lively swimmingtropical fishes & colorful corals & shells aswallpaper/background with exquisite 3D animation, which canpersonalize your phones easily.🎁 Features:- Fabulous 3D transitioneffects on screens and folders switching.- Elegant and simple 3Dscreen navigation.- Screen management interface with incredible 3Deffect.- Astonishing 3D clock widget and starfish weather widget.-Dynamic display on All Apps alphabetical list, or “App drawer”.-Compatible with 99% phones device.- Very small, will not affectsystem performance.- Battery save function.⭐ Notice:The livelyDynamic 3D Aquarium Fish Theme is only available for phones withour launcher installed.🌊 How to Apply the Theme:1. Download andinstall the cheerful Dynamic 3D Aquarium Fish Theme;2. Install our3D launcher;3. Start our launcher and then you can apply the livelytropical ocean theme you downloaded. If you already have ourlauncher on your phone, you can also directly go to “Themes--Mine”to open the heavenly ocean scenery theme and apply it to yourphone.If you like this lively Dynamic 3D Aquarium Fish Theme,please support us by rating it.If you have any ideas orsuggestions, contact us by email: [email protected], we are sohappy to receive your valuable advice. Your satisfaction is thebest payback for us! The 3D glitter neon butterfly theme has 3D glitter neon butterflylive wallpaper with pink background, flower lock screen and pinkdiamond icon pack .This beautiful 3D glitter neon butterfly themeis specially designed for people who loves flower and diamond. 3Dglitter neon butterfly theme is an exclusive theme with HD livewallpaper to bring you a pink flower feeling. This 3D glitter neonbutterfly theme is the most popular pink flower theme in the 2017new year. Hope you will love this 3D glitter neon butterfly themeto look beautiful on android phone. No matter you like girly HDlive wallpaper or diamond mobile phone, you will like this pinkgirly flower theme with diamond decoration. Beautify your androidhome with this 3D glitter neon butterfly theme now! Customize yourmobile phone with girly style to meet your new 2017. A exquisitebutterfly is presented in front of you, it is rosa preple and alsoa successfully butterfly, in the present it is a dynamic matter.because the butterflies is flying in the 3D theme. I hope this rosapreple butterflies can fly on your phone. A exquisite butterfly ispresented in front of you, it is rosa preple and also asuccessfully butterfly, in the present it is a dynamic matter.because the butterflies is flying in the 3D theme. I hope this rosapreple butterflies can fly on your phone. Be a superstar and don'thesitate to download for free this amazing 3D glitter neonbutterfly theme for your mobile smartphone or tablet! ◆ Features:1、3D glitter neon butterfly lock screen theme with girly flowerdiamond HD live wallpaper. 2、Animated girly flower diamonddecorating your screen; 3、Full support for landscape mode and home- screen switching! 4、3D glitter neon butterfly HD live wallpaperwith 3D glitter neon butterfly theme make it unique girly style.5、3D glitter neon butterfly lock screen to protect android privacyeasy safe 6、3d dynamic launcher home to make your android phonespecial girly style. 3D glitter neon butterfly theme - how to useit? This 3D glitter neon butterfly theme is specifically designedfor Launcher. You need to install our launcher first to apply itsuccessfully. It does not support any other Launcher app. 3Dglitter neon butterfly theme with girly pink flower diamond HD livewallpaper is free and has no ads! No matter what model your phoneis, 3D glitter neon butterfly theme is designed to let you enjoy afaster and smoother mobile operating experience. The 3D glitterneon butterfly theme has pink balloon dynamic HD wallpaper,consistent with the girly icon style. After apply the 3D glitterneon butterfly theme successfully, you can also only change thebackground wallpaper and lock screen wallpaper but keep the pinkdiamond flower icon stay the same. If you do not like this 3Dglitter neon butterfly theme, you can also uninstall it anytime atanywhere, it will not leave you any garbage in your mobile phone.You can DIY HD live wallpaper and change as you wish at any timeinto our theme and wallpaper center. ★ We have more holiday themescoming to celebrate happy festival theme, and we will present tonsof the themes for you, like cool, cute, 3D, animal, neon,technology, and so on. All themes and wallpapers free . ★ Afterdownloading our launcher , you can use our free keyboard and HDwallpaper center with lots of exquisite themes and wallpapers,which will give you a unforgettable experience when you are usingkeyboard. You can choose a cool keyboard theme , or you can alsoset a pink color keyboard theme for girlish girl. No matter whatkind of keyboard you want, we will present it in our theme center ★3D glitter neon butterfly theme is made for launcher to customizeyour mobile phone with 3D glitter neon butterfly live wallpaper andflower screen lock . Do you want to have a special girly flowerdiamond keyboard with this pink theme? Just visit the app center tosearch whatever you need in this 3d dynamic launcher! Personalize your phone with the world's leading 3D launcheranimation technology and gyro wallpaper. 3D Love Rose Theme is a 3Dlauncher theme with 3D glitter blue diamonds live wallpapers androse petal style icon packs. Download and apply 3D Love Rose Themefor free to decorate your Android phone in valentine style, youwill get a 3D weather and 3D clock to enjoy a 3D theme visual andinteractive experience. Valentine 3D Love Rose Theme is designedfor better using experience. 3D Love Rose Theme is designedespecially for Launcher users. Long press to activate each theme’sunique set of 3D theme live interactive effects. Activate each livewallpaper unique set of 3D launcher live interactive effects bylong press, there are endless gyro wallpaper surprises waiting foryou to explore.☆ The Romantic Valentine 3D Love Rose Theme feature:Glitter blue diamonds lock screen with dreamy color. Cool fashionwallpaper will be there once you swipe up the fluorescent lockscreen. This provides security for your privacy. Using 3D Love RoseTheme will automatically apply sorting function. Sort your appsinto folders and make your desktop tidy.Romantic blue rose skinwith elegant stylish icon designs for 56 popular appsCool fashiondreamy 3D theme’s app icon packs give your phone a brand newlookAnimated dreamy stylish rose decorates your phonescreenStunning interface: 3D Motion weather forecast plus 3Dsparkle diamonds wallpapers and rose petal app icons, vivid andlovely.☆ Other features you can enjoy for free in 3D Love RoseTheme for Huawei Samsung:Use 3D Love Rose Theme for 3D Launcher, noneed to root, you can easily protect some apps from peepers byhiding them in a special folder.3D Love Rose Theme for HuaweiSamsung has world leading 3D transition effects on screens andfolders switching and elegant and simple 3D screen navigation.LoveRose Theme for 3D Launcher screen lock (locker) protects your phonefrom strangersUse 3D Love Rose Theme for 3D Launcher automaticallysorting function. Sort your apps into folders and make your desktoptidy.Free romantic valentine rose theme stunning icons designed forpopular apps and system apps and amazing 3D transition effects withsparkle blue live wallpaper Romantic Love Rose Theme for 3DLauncher app tech icon packs to give you a new phone you neverused3D Love Rose Theme for Launcher DIY live wallpaper: you canbecome a designer to make your own 3D live wallpaper hereCompatiblewith all phone models, including OPPO, Huawei etc.☆ Things toexpect in our Launcher 3D live wallpaper center:- Over a thousandsets of different live wallpaper and tens of thousands of beautifulwallpapers. Regardless of your taste, there‘s always something herethat’s right for you.- The latest 3D launcher animated livewallpaper and gyro wallpaper, along with a large variety of 3D livewallpaper, VR live wallpaper, cartoon live wallpaper, with custommade recommendations based on your preferences.☆ Before installingromantic 3D Love Rose Theme, you have to install our Launcherfirst. If you love this theme, please rate and let us know yourfavorite features! 3D Love Rose Theme is created to make your phoneunique!